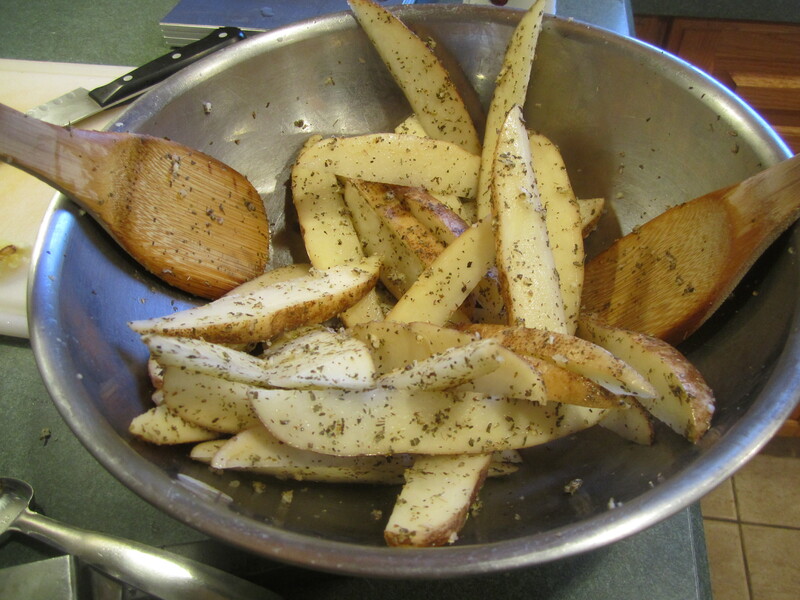 I originally got this idea from either The Victory Garden or Julia Child or both. I can’t remember, it’s been so long. I have modified this recipe alot over the years and finally took pictures and wrote down exactly what I did, last night . 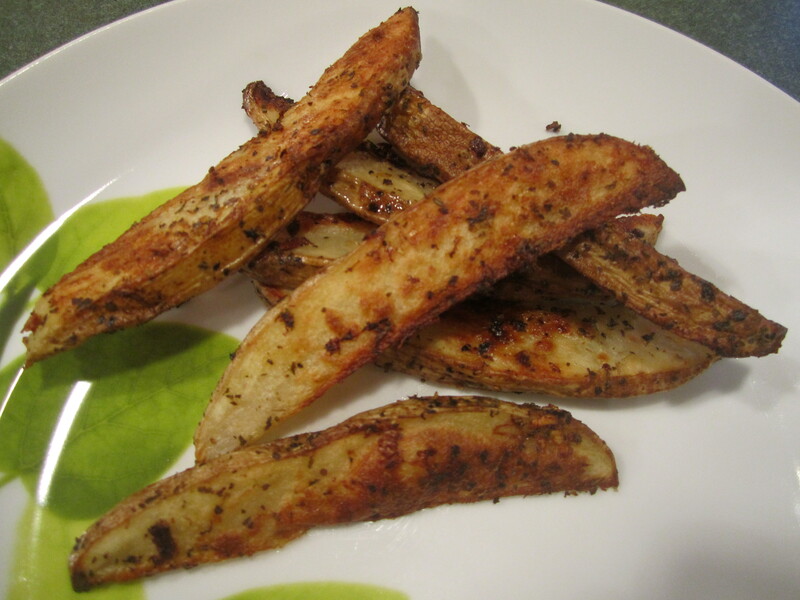 You can certainly tweak this recipe yourself, adding more or different spices or fresh instead of dry but this is the basic recipe. I usually serve it with steak, which I did last night or steak sandwiches but occasionally I have served it with grilled chicken. It makes enough for 4 people or 2 people with plenty of leftovers. It’s also great served the next day, cold, over mixed greens and some leftover steak (or chicken) – yum! Preheat oven to 400 degrees. 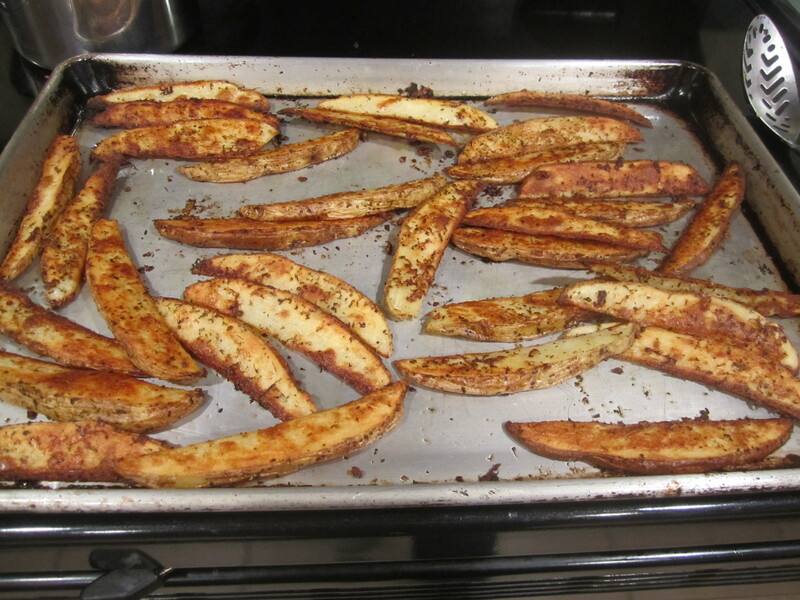 Spray a large rimmed cookie sheet with canola oil spray. 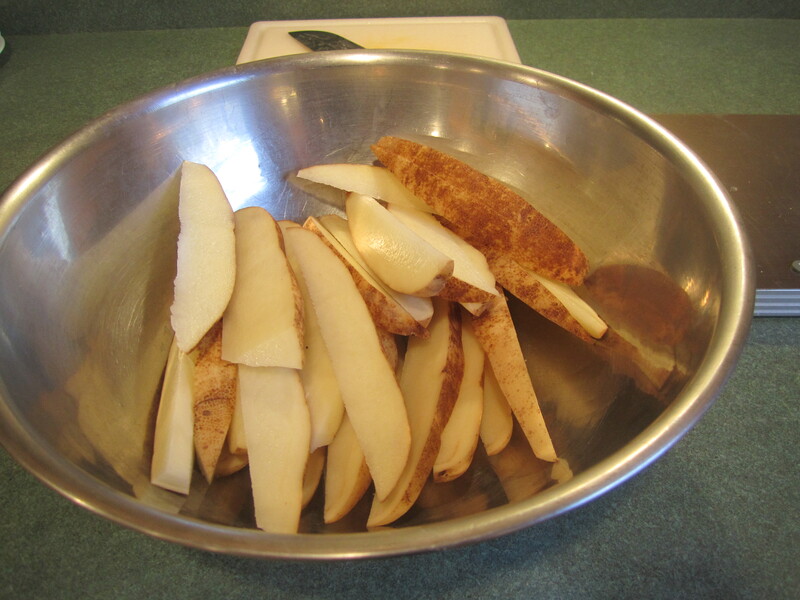 Wash the potatoes thoroughly, using a scrub brush if necessary to get all the dirt off. 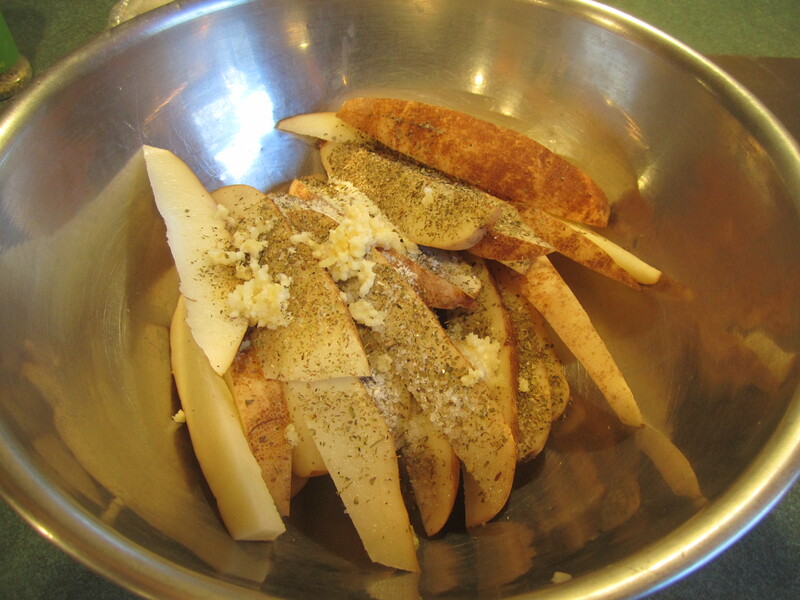 Dry the potatoes. 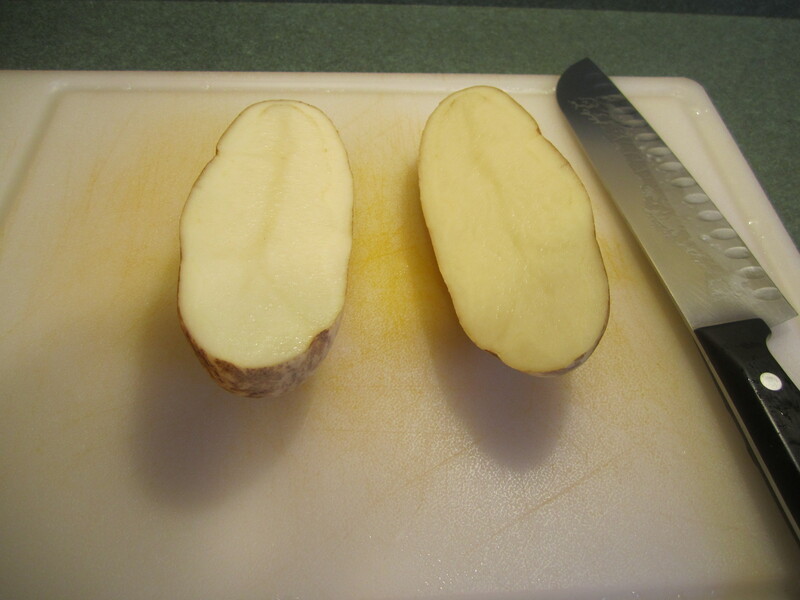 Cut the potato in half-length wise (see pictures below), take one of the halves and cut in half lengthwise again. 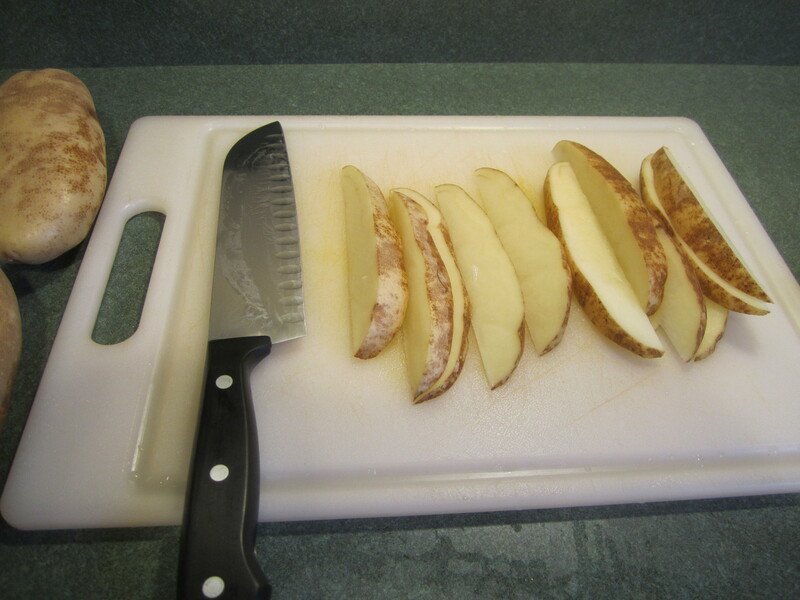 Then cut each quarter into 3 even wedges (be careful, this is very awkward and you can easily cut yourself ). Repeat with the other half and the other potatoes. 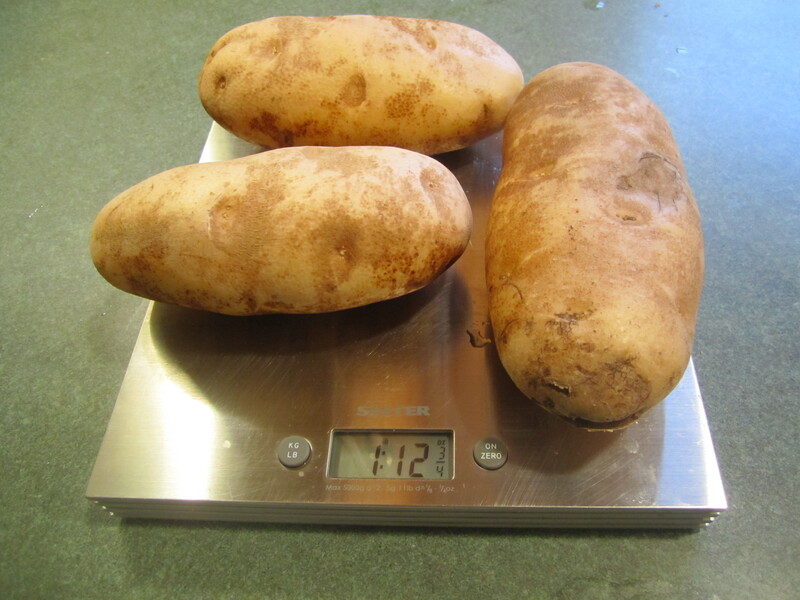 Place potatoes in a very large bowl. 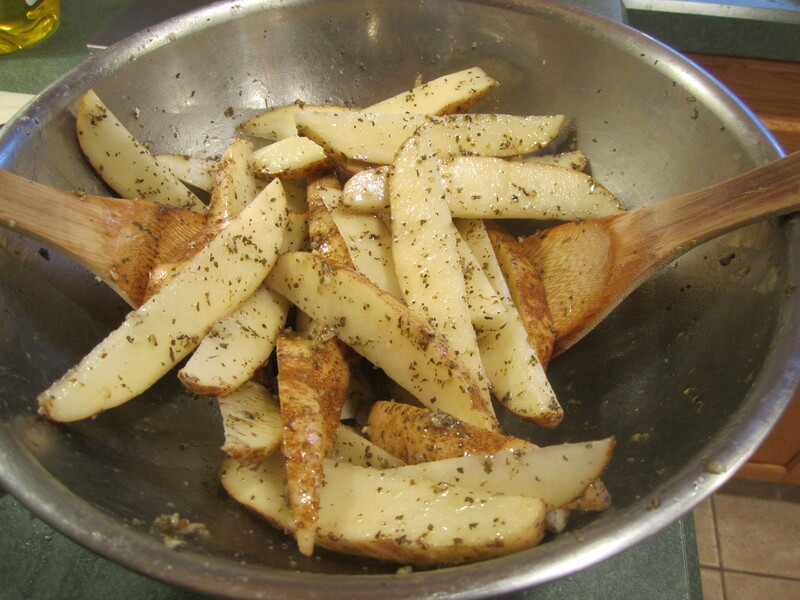 Pour olive oil over potatoes and again toss thoroughly until everything is coated. 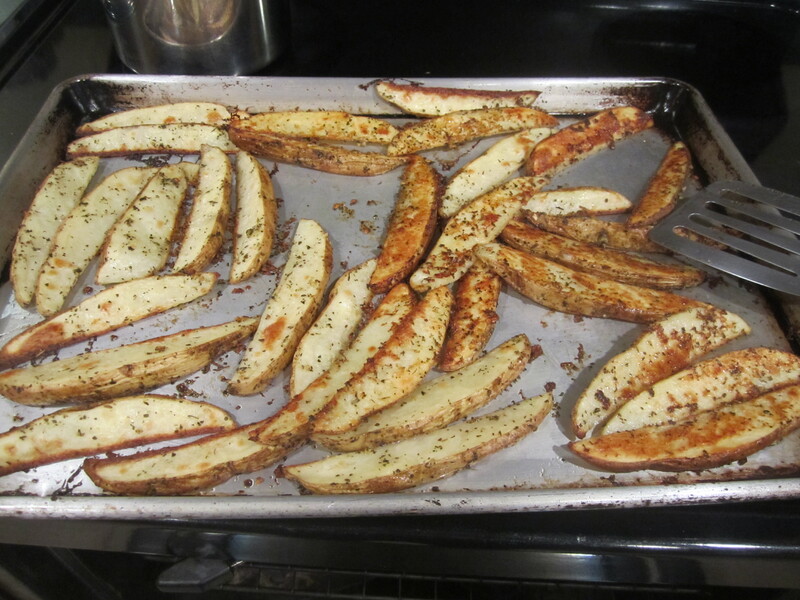 Place potatoes onto cookie sheet, distributing the garlic more. 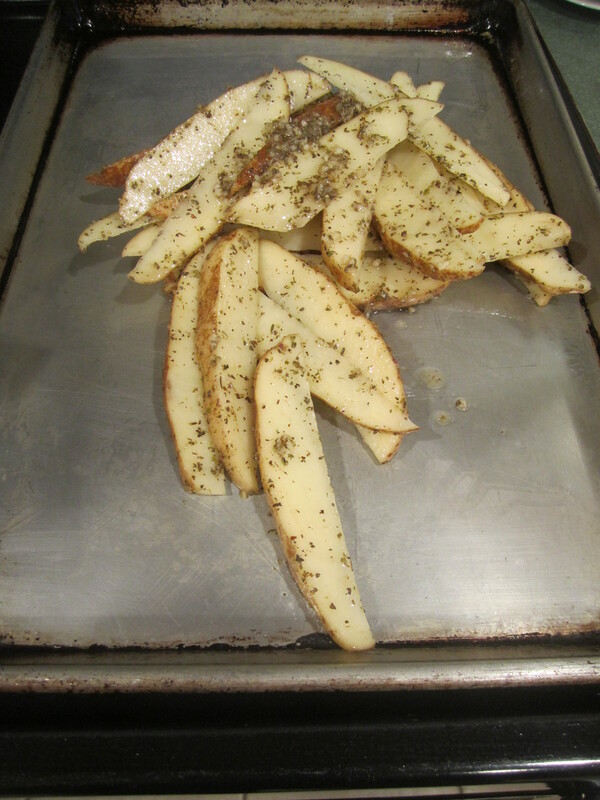 Spread the potatoes on the cookie sheet in one layer. 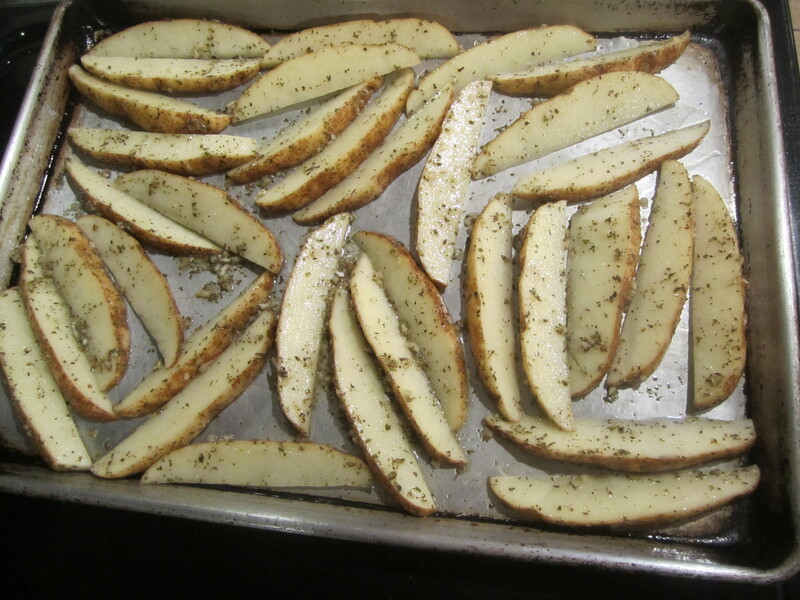 Place in oven and bake for 30 minutes. 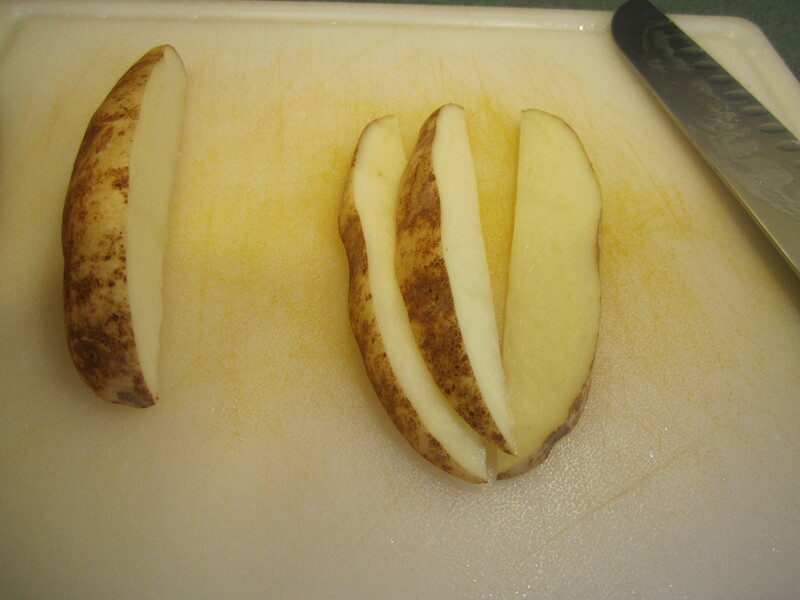 Half way through the cooking time, take the potatoes out and flip over. Continue to bake. 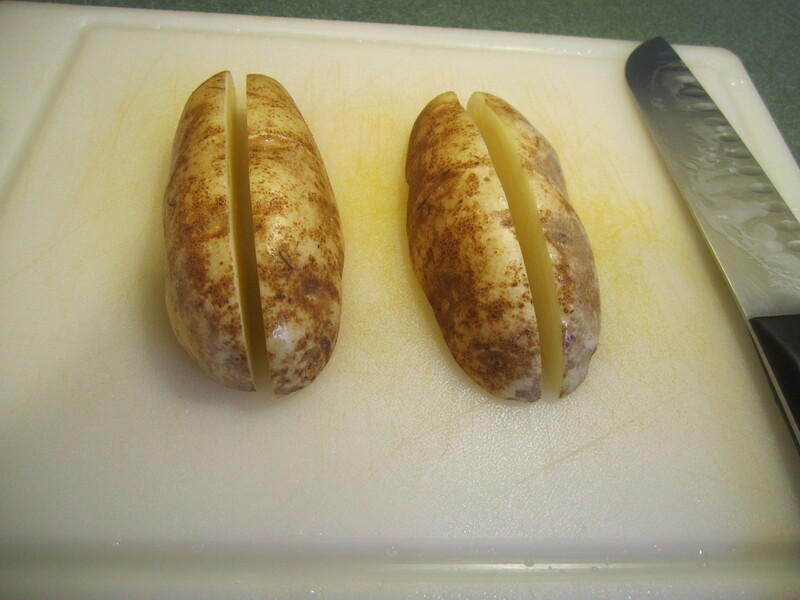 After 30 minutes, see how they are. We like ours very crispy so I usually bake them for an additional 10-15 minutes. thank you! and they are very easy to make!